Superior Source Vitamins gave me this product to try. For more information, on the FTC Endorsement Guides, go to http://bit.ly/1FRMynQ. Superior Source MicroLingual tablets, manufactured by Continental Vitamin Company has provided trusted vitamin tablets and dietary supplements since 1969. 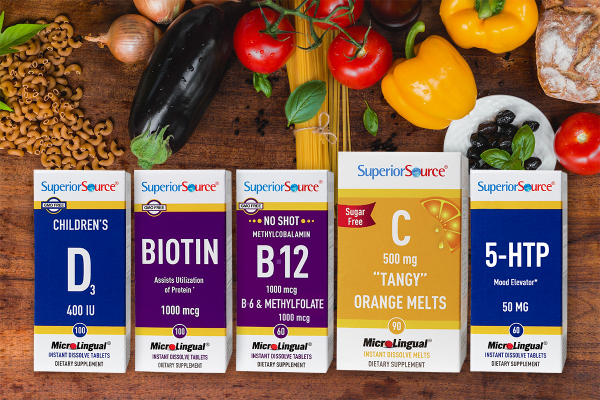 One unique feature of Superior Source Vitamins is that they are MicroLingual which means they use “Under the Tongue Technology”. A lot of people have problem swallowing pills so this is great for those people, but there are other benefits of MicroLingual technology. Research has shown that by swallowing supplements they can lose as much as 50% of their effectiveness due to the highly acidic environment in the stomach, plus they dissolve in seconds and are quickly absorbed into the body. 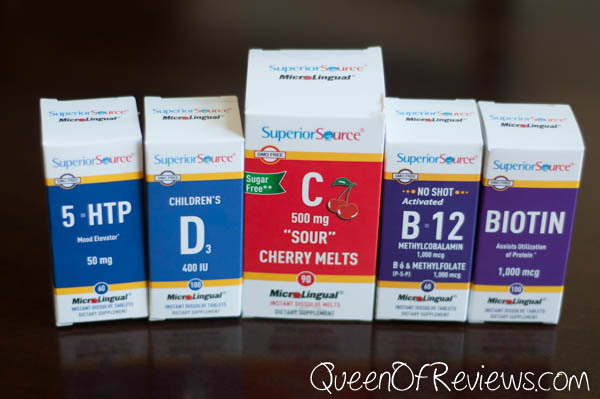 Superior Source Vitamins are also unique because they are GMO Free and Sugar Free, they are 90% smaller than regular vitamins and contain no binders, fillers, dyes or preservatives, only 3 clean ingredients and are available in over 150 vitamins to choose from. Check out the amazing free offers below! FREE Vitamin B-12 60 Day Supply 1,000 mcg (only pay$3.95S&H) Get it here! FREE Vitamin D Any D product(baby,child,adult) (only pay $4.95 S&H) Get it here! BOGO FREE Vitamin C (Sour Cherry or Tangy Orange)–500 mg–Buy One Get One Free Get it here! Children’s D Vitamin D works in conjunction with calcium to promote the development and maintenance of strong bones and teeth. Superior Source Vitamins Vitamin D products are D3, the finest source of Vitamin D available. The Instant Dissolve MicroLingual® Tablets go to work fast, under the tongue. Vitamin C is an essential nutrient that cannot be produced by the body, therefore, it must be replenished daily. Vitamin C has several beneficial purposes including developing and maintaining healthy skin and bones, to form collagen and also enhances the absorption of iron from plant-based foods we eat. Vitamin C also provides support to the body’s immune system. Superior Source Vitamin C 500 mg, “Sour Cherry Melts”,utilizes sodium ascorbate, which is a buffered (non-acidic) form of C that does not contribute to gastric irritation. NO sugar added; only sweetened with a little stevia. This is preferable to most “chewable” vitamin C products that typically are loaded with lots of sugar. Vitamin B-12 No Shot Methylcobalamin Vitamin B-12/Vitamin B-6 w/L-5 Methyltetrahydrofolate MicroLingual® Tablets go to work fast, under the tongue. Other forms of Vitamin B-12 supplementation can result in a loss of as much as 50% of Vitamin B-12 potency in the high acid environment of the stomach. This supplement is a combination of activated B-12 (methylcobalamin), activated Folate (L-5 methyltetrahydrofolate) and B-6, which are three critical B vitamins required for control of elevated homocystein levels. Enter using the Giveaway Tools widget below to win an assortment of vitamins from Superior Source! I don’t have a vitamin regiment yet. I am seriously considering starting one soon. I take a daily multi vitamin if I don’t forget. I take a one a day vitamin every morning. Yes, I take many of the vitamins in this giveaway. Yes. I take vitamins daily. I take several vitamins when needed. I need to get better at it. Yes, I take biotin and a women’s vitamin every day. I think they are very important for women at any age. I take a cheap multi-vitamin currently. I take Vitamins C, D, k & B-6 plus magnesium and CoQ10 to counteract Statin drug damage. I take Vitamins B12, C, D, probiotics, and ashwagandha! I take magnesium, niacin, B complex, and krill oil. I don’t. To be honest, I’ve started taking vitamins a couple times and I usually sort of peter out after a few weeks. No, i have yet to set up a daily vitamin regimen although i should at least be taking a men’s daily vitamin. Yes, I take vitamins every day. Thank you! No, I don’t take vitamins but I really should start to. I take vitamins & have a pill box but sometimes forget. I take vitamin D and sometimes a multivitamin. I recently do multi vitamins. Yes I’m addicted to vitamins! I just take a men’s daily vitamin! I sometimes take a multi-vitamin, but not daily. I try and take a multivitamin everyday. I take a multigreen vitamin and magnesium everyday. I try to take calcium on occasion also. I take COQ10 and several vitamins to help with sugars. I do not take any of these. However, I think I should start. They all look very helpful to the body. I take black seed oil daily but need to start a multivitamin. Presently, I only take one vitamin per day.